There was a post on BeeSource.com last year that asked experienced beekeepers what advice the would offer that perhaps wasn’t typically taught in books. There were a couple suggestions I started using, and today I may have learned that one of them can present some problems. One idea was about how to place frames back in the hive. Rather than setting them in the box and pushing the frames together, I slide frames into the box along an existing frame. Pushing two frames together risks squishing bees, whereas the bees tend to get out of the way as you slide the frame in. This has worked well for me. Another idea was to inspect the boxes from the bottom to the top. That is, take the top boxes off one at a time to create a reverse stack to the side. 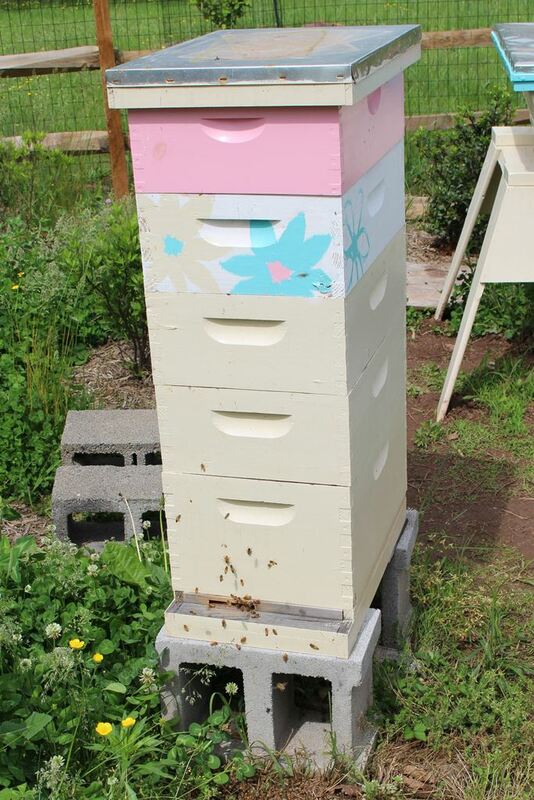 Then inspect the bottom first, and place the next box on top to inspect it; and repeat the process until you reach the top of the hive. 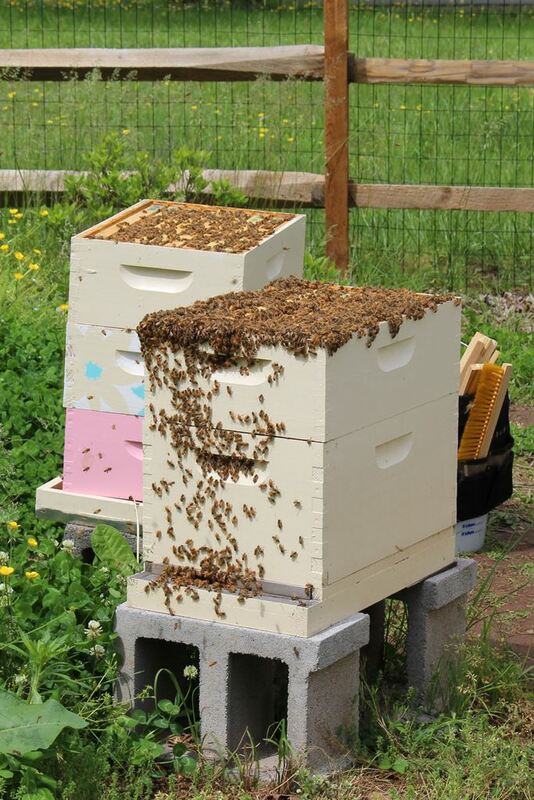 In theory the bees stay calmer because you disturb them more from the bottom up rather than the top down. Mars, during the inspection. The hive is boiling over with bees. I’ve been employing this approach since I read about it, and for the most part it has been fine. Today I did this with Mars, a hive now five boxes tall (one deep and four mediums), and it did not go well. The hive had high mite count on April 24, and I treated them with the organic compound formic acid. Today was my first full inspection since then. There were a lot of bees, and each time I returned a box to the stack I couldn’t help but crush some. When a bee dies it releases an alarm pheromone that serves as an alert to other bees that the hive is in danger. Hence as I returned boxes to the stack, and crushed some bees, I think the bees became more and more angry. Sometime last year I stopped worrying about my legs, as the bees seemed to ignore them. I wear sneakers and long socks, without tucking my pants in. Today a bee found this entrance and gave me a nasty sting on the leg. I quickly cleared away a couple bees and tucked my pants in; without thinking to check my leg. So the stinger stayed in and pumped a full dose of venom into me. It still hurts to walk and itches this evening, 10 hours after the deed. Later when I trapped a bee between my hive tool and glove, I received another sting between two fingers on my right hand. Another got a right finger tip while I was taking a picture and had my glove off. So not one, not two, but three stings today! I was only stung twice last year, and once in March. So in one hive inspection I have doubled my total sting count (ow!). Mars, by the way, has hardly any brood, and no larva. Perhaps they replaced the queen for some reason, or are on a brood break due to our cold nights recently. I’m not sure what to make of it, so I will have to check Mars again in a week or two to verify that a queen is present and laying. My next inspection will likely be from the top down, with my pants tucked into my socks. I might even wear boots. With all those bees Mars is bringing in a good bit of nectar. 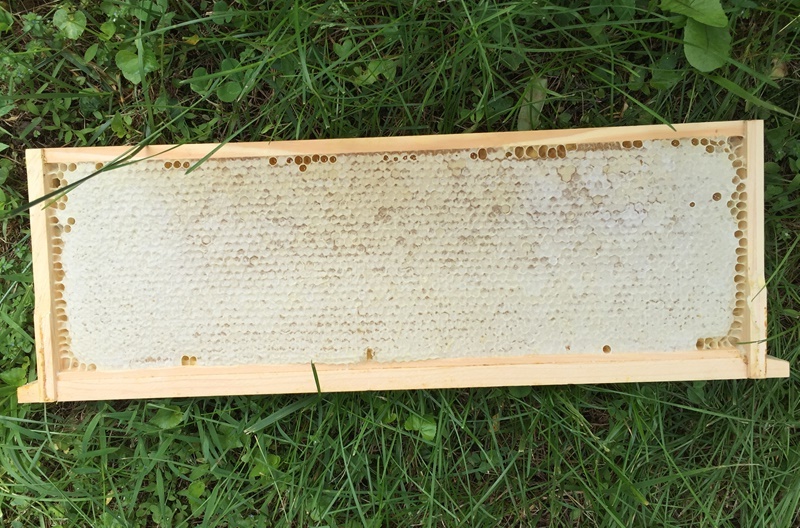 There are at least 12 capped frames of honey so far, including this one. Our title comes from Gustav Holst’s orchestral suite The Planets. The first movement is called Mars, the Bringer of War. When I thought about hundreds of bees buzzing around, stinging me three times, and chasing me afterwards whenever I went within 30 feet of the bee yard, this music came to mind. Oh dear! Brood pheromone has a calming effect on bees, so broodless hives often are more grumpy. I wondered about that as well. 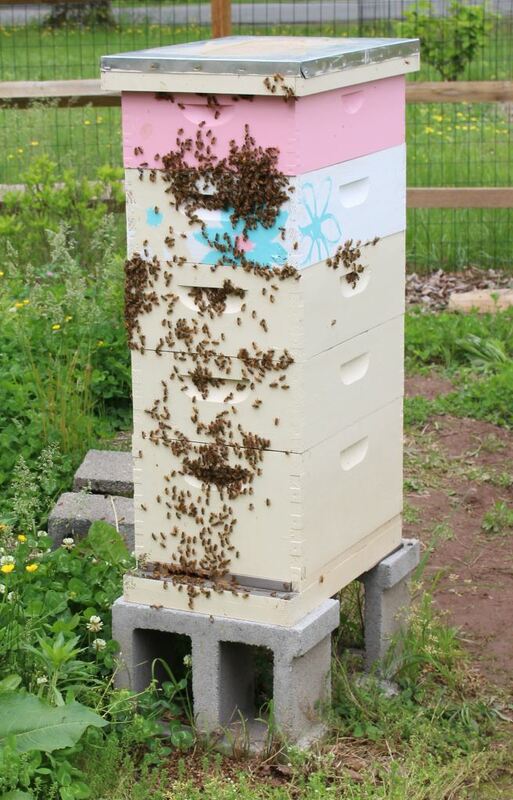 Normally this hive is pretty tame, and I’m not sure why the queen isn’t laying. We’ve had some cold nights, and Russian bees are known to stop laying in cold weather, or perhaps my treatment with formic acid set the hive back (although I only used a single strip) I’ll check it again in a week or two, hopefully all is okay. Don’t want to worry you but I know a few beekeepers who have lost queens after treating with formic acid. However I know others who have used it several times without problems. Perhaps it has just put her off laying for a little while but I wouldn’t leave the next inspection too long in case there is a problem and you get laying workers. I’ve heard that, which is why I only did a single strip – basically a half dose – as recommended by Randy Oliver. Thanks for the thoughts. I’ll cross my fingers.